Be sure to come visit us at one of our three designated eagle viewing stations this weekend to see what’s happening on the Skagit in eagle world. We will have staffed stations on Saturday and Sunday from 10:00-3:00 at Howard Miller Steelhead Park in Rockport, Milepost 1oo (Sutter Creek Rest Area) and Marblemount Fish Hatchery. See you out there! Top Left: Volunteer Matt assisting with eagle ID just outside Concrete. Bottom Left: Can you see the 7 eagles in this photo? Right: Two sub-adults perched right next to the road. Another winter is here and it’s good to be back on the eagle survey. 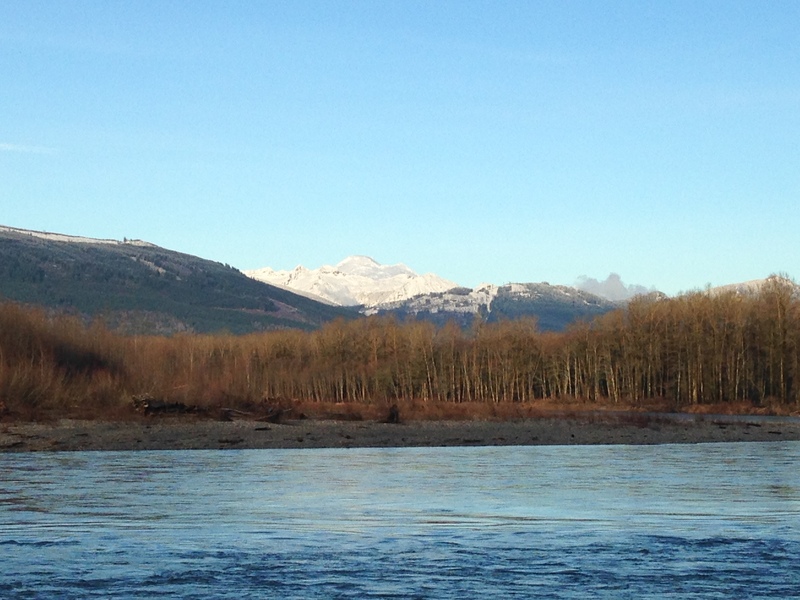 Heading out Wednesday morning December 9, 2015 we were not sure how many eagles we would see, since the Skagit was swollen with rainwater from a potent storm. The Skagit was flowing at somewhere around 70,000 CFS when we captured this shot from the Dalles Bridge in Concrete. One of those big firs on the left bank hosts a bald eagle nest. With all the beaches and bars submerged, the usual food sources (mainly salmon carcasses) would be scarce. Gilligan Creek river access on the Skagit, December 9, 2015. This is not Gilligan Creek, but rather the trail that leads down to the beach. During the 7 hour survey, sheets of rain alternated with sunbreaks and rainbows, and surveyors from all three river segments reported many eagles on the move, soaring and flying. The rest were patiently perched, conserving energy as they waited out the floodwaters. Howard Miller Steelhead Park, December 9, 2015. Riverfront campsites, indeed! The river water is back down now (Dec. 11) and the park and campground are open for business! There were many large trees and logs on the move in the river, which was exciting to watch. It was not a good day to get too close to the riverbank! Here is river right at bankful at Martin Road. No gravel bars in sight. Water levels are returning to normal and our three eaglewatcher sites (Howard Miller Steelhead County Park in Rockport,Sutter Creek Rest Area at MP 100 on Highway 20, and Marblemount Fish Hatchery) are all accessible for our first viewing weekend. Reports from Rockport are that eagles are out and about. First Eagle Count of the Season! It was our first (of six) eagle count of the season yesterday and with high water we didn’t see many eagles out and about. Check out the numbers below and stay tuned for photos of the count.